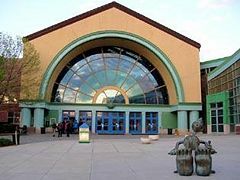 The Buell Children's Museum in Pueblo, Colorado was ranked #2 children's museum in the United States by Child Magazine. Children's museums are institutions that contain exhibits and experience-based informal learning programs for children. In contrast with traditional museums that typically have a hands-off policy regarding exhibits, children's museums feature interactive exhibits. Such exhibits emphasize activity as an important form of education, especially for children. Furthermore, interactive exhibits are also designed to inspire excitement and to nurture a child's creativity. The layout and exhibits of a children's museum also factor in studies in the development of a child's cognitive and learning process. International professional organizations of children's museums include the Association of Children's Museums (ACM), which was formed in 1962 as the American Association of Youth Museums (AAYM) and in 2007 counted 341 member institutions in 23 countries, and The Hands On! Europe Association of Children's Museum (HO!E), established in 1994 with member institutions in 34 countries as of 2007. Many museums that are a part of ACM offer joint memberships, allowing members of one museum to visit all the others for free. The Children's Museum of Indianapolis (1925) According to the ACM, this is the world's largest children's museum. By 1975 there were approximately 38 children's museums in the United States. An additional 80 institutions opened between 1976 and 1990, and more than 130 opened between 1990 and 2007. Most children's museums are nonprofit organizations, and many are run by volunteers or by a small number of professionals. As of 2007, ACM estimated that there were approximately 80 children's museums in the planning phase. The children's museum concept has spread worldwide from the United States. Le Musée des Enfants in Brussels was started in 1978, inspired by the Boston Children's Museum. The Boston museum also inspired the Museo Pambata in Manila, which opened in 1994. The Children's Museum of Caracas, Venezuela, became Latin America's first museum for children when it opened in 1982. The Children's Museum of Bogotá, Colombia, followed it in 1986. Eureka! The Museum for Children in Halifax, England, established in 1992, claims the title of the United Kingdom's first hands-on children's museum. Austria's first museum for children was ZOOM Children’s Museum in Vienna, established in 1994. Korea's first children's museum is the Samsung Children's Museum in Seoul, which opened in 1995 under the sponsorship of the Samsung Culture Foundation. The Brooklyn Children's Museum is a general purpose museum in Crown Heights, Brooklyn, New York City, USA. Founded in 1899, it was the first museum in the United States and probably the world, to cater specifically to children and is unique in that it is located in a predominantly residential area. The museum underwent an expansion and renovation to double its space, re-opened on September 20, 2008, and it is projected to be the first green museum in New York City. The Museum was founded following a proposal from the Brooklyn Institute of Arts and Sciences (now the Brooklyn Museum) on December 16, 1899 in the Adams House. The museum operated under the direction of the Brooklyn Institute and received approximately $70,000 in funds from New York City each year to supplement the donations it received. Attendance grew quickly, with monthly visitation exceeding 13,000 by October, 1905. In 1929, the museum opened the Smith House annex. In 1930, the Works Progress Administration supplied hundreds of workers to the museum, which thrived in the Great Depression. By October 1930, monthly visitation had reached 60,000 and by 1939, the museum had received more than 9 million visitors since it opened 40 years prior. In 1975, the museum moved to an award-winning new space, housed underneath Brower Park following the demolition of the Victorian houses that served as its prior home. In 1996, the museum was once again renovated at a cost of $7 million to include miniature amphitheaters and a number of new galleries. Two years later, it became a part of Heart of Brooklyn, a cultural partnership established to promote tourism to Brooklyn. In 2005, it was among 406 New York City arts and social service institutions to receive part of a $20 million grant from the Carnegie Corporation, which was made possible through a donation by New York City mayor Michael Bloomberg. In the same year, work began on the $43 million dollar expansion that was to nearly double the size of the museum, and handle more than 400,000 visitors each year. As part of its commitment to environmental integrity and energy efficiency, the institution has taken credit for being the first New York City museum to use geothermal wells for heating and cooling purposes. The museum's collection and exhibits reflect its long history as well as the changes in children's educational needs over time and the changing environment. Its original focus was the presentation of natural science to children raised in an urban environment, but following World War II, technology and cultural awareness became more important. The museum was not intended to solely attract the interest of a young audience, but rather to engage their minds from a young age. Children contribute extensively in the planning of museum exhibits, and have done so for a significant part of its history. The Boston Children's Museum is a children's museum in Boston, Massachusetts, dedicated to the education of children. Located on Children's Wharf along the Fort Point Channel, Boston Children's Museum is the second oldest children's museum in the United States. It contains many activities meant to both amuse and educate young children. "it is planned to inaugurate at the same place, a Museum, local in its nature and to contain besides the natural objects, books, pictures, charts, lantern slides, etc., whatever else is helpful in the science work of the Grammar, High and Normal Schools. The specimens are to be attractively arranged and classified and the room open daily to children or anyone interested in such work." The Women’s Education Association also helped the Science Teacher’s Bureau with the planning for the children’s museum in Boston. After four years of planning, The Children’s Museum officially opened on August 1, 1913, at the Pinebank Mansion located along Jamaica Pond in Olmsted Park in Boston’s Jamaica Plain neighborhood. The first museum contained two cases: one devoted to birds and the other to minerals and shells. The exhibits were kept at children’s eye level, used simple language, and complemented the lessons taught in school. George H. Barton served as the museum’s first president. During the early years of the museum, leaders created branch museums throughout Boston so that children in other parts of the city could experience the museum as well. The first branch museums were located in schools, including the Quincy School on Tyler Street, the Abraham Lincoln School, the Samuel Adams School in East Boston, and the Norcross School in South Boston. These museums usually consisted of a single room that contained a case of some specimens. In 1919, the Children’s Museum opened a much larger branch museum in the Barnard Memorial Building on Warrenton Street. Known as the Barnard Memorial Branch Museum, it contained a number of different exhibits throughout the building. The Barnard branch closed in 1926. In 1935, the museum’s lease on the Pinebank Mansion expired, and leaders decided that they needed a bigger space for the museum. They learned that a property was available a few blocks away on 60 Burroughs Street on Jamaica Way and purchased the building from the Mitton family. The Children’s Museum opened at its new location on November 18, 1936. Michael Spock, son of Dr. Benjamin Spock, served as the director of the museum from 1962-1985. He introduced the idea of “hands-on learning” to the museum, and the first interactive exhibit in the museum, “What’s Inside,” was created during his term. In 1972 the museum was accredited by the American Association of Museums. In 1986 Kenneth Brecher became the director of the museum. During his term, Kids Bridge, a groundbreaking exhibit on cultural diversity and racism, opened at the museum. The exhibit later moved to the Smithsonian Institution before embarking on a three-year tour around the United States. Lou Casagrande has served as the museum’s president and CEO since 1994. The museum has opened several important exhibits during Casagrande’s term including Five Friends from Japan, access/Ability, and Boston Black: A City Connects. 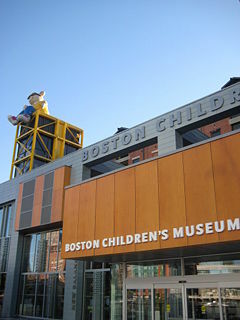 In 2004, The Children’s Museum of Boston officially became Boston Children’s Museum. In April 2006, the museum broke ground on a $47-million expansion and renovation project and closed for four months at the beginning of 2007 to complete the project. The project added a 23,000-square-foot (2,100 square meter), glass-walled enclosure to the front of the museum, a new theater, new exhibits, and a newly landscaped park. The museum also focused on making its renovation “green” and is the first green museum in Boston. It reopened on April 14, 2007. In early 2008 Boston Children's Museum received LEED Gold certification from the U.S. Green Building Council. Arthur & Friends: The exhibit features the characters from Marc Brown’s books and the television series. Children can learn and play in the Read Family Kitchen, Mr. Ratburn’s Classroom, and the Backyard Sleepover. Art Studio: The Art Studio is a place where children and families can create art together. Boats Afloat: Kids have a chance to float boats and barges in a 28-foot, 800-gallon water tank made to resemble Fort Point Channel at Children’s Wharf. Other activities include acting as a marine fireman or lobster-boat captain. Boston Black… A City Connects: This exhibit explores Boston’s Black community and its history and diversity. Children can decorate and ride on a Carnival float, shop at a Dominican store, learn about hairstyles at Joe’s Barber Shop and African Queen Beauty Salon, and dance to Cape Verdean beats. The Common: The Common is a place where visitors can experience light shows, musical chairs, a gigantic chess game, and many other activities. The Common is also used for gatherings. Construction Zone: Inspired by the Big Dig, the Construction Zone gives visitors a chance to ride a Bobcat, play with trucks, and use jackhammers. The Gallery: The Gallery is an activity and art exhibition area. Global Gallery: The 2,500-square-foot space hosts exhibits from around the world. Japanese House: The Japanese House is a real two-story house from Kyoto, Japan, Boston’s Japanese sister city. Visitors can learn about Japanese family life, culture, art, architecture, and seasonal events at the exhibit. Johnny's Workbench: Visitors are able to work with hand tools and natural materials at this exhibit. The exhibit was recently updated, and now visitors are able to create a small woodworking project to take home. Kid Power: This exhibit teaches visitors how to live healthier lives by eating right and exercising. KidStage: At KidStage, visitors can watch, eat the performers, and often participate in performances on the kid-sized stage. The exhibit introduces children to the performing arts—music, singing, dance, and comedy. New Balance Climb: The New Balance Climb is a three-story climbing structure located in the front of the museum. It was designed by Tom Luckey. PlaySpace: PlaySpace is for the museum’s youngest visitors—children between the ages of 0-3 years. Children can explore a tree house climber, a toy train area, and a see-through painting wall. The exhibit also includes an infant area with soft areas to lie and climb on. The Recycle Shop: Visitors to this area can buy a number of reusable items, including fabrics, plastics, papers, and strings, to use in arts and crafts projects. Boston Children’s Museum has an extensive collection of objects from around the world. Most of the objects were donated to the museum. The museum currently has more than 50,000 objects, but most are kept in storage away from visitor areas. Visitors can see some of the objects in the Native American Study Storage area and the Japanese Study Storage area on the third floor of the museum and in window displays throughout the museum. The museum also lends objects to schools through its Educational Kits Program. Boston Children’s Museum has inspired both the Museo Pambata in Manila, Philippines, and Le Musée des Enfants in Brussels, Belgium. The museum is housed in a renovated industrial building. A large glass elevator provides access to the upper floors of the museum. (The elevator was once located outside the museum but is now located inside after the 2006-2007 expansion and renovation). The ground floor houses the museum's admissions area, a gift shop, and an Au Bon Pain outlet (previously McDonald's). Outside, a large deck overlooks the Fort Point Channel and Boston Harbor and hosts the landmark Hood Milk Bottle. The Hood Milk Bottle is an ice cream stand and snack bar located on the Hood Milk Bottle Plaza in front of Boston Children's Museum. It has been located on this spot since April 20, 1977, when Hood shipped the bottle by ferry to Boston on a voyage it called the "Great Bottle Sail." The structure is 40 feet (12 m) tall, 18 feet (5.5 m) in diameter and weighs 15,000 pounds. If it were a real milk bottle, it would hold 58,620 gallons (221,900 L) of milk. The bottle recently underwent extensive renovations. In fall 2006, the bottle was "uncapped"—its original top half was sliced off and preserved—so that its base could be moved slightly and rebuilt on the new Hood Milk Bottle Plaza. A renovated bottle was put back in place and officially re-dedicated by Boston Mayor Thomas Menino on April 20, 2007, thirty years to the day after it was moved to Children's Wharf. The Hood Milk Bottle was originally located on the banks of the Three Mile River on Winthrop Street (Route 44) in Taunton, Massachusetts. Arthur Gagner built the structure in 1933 to sell homemade ice cream next to his store. It was one of the first fast-food drive-in restaurants in the United States and was built using the "Coney Island" style of architecture. Gagner sold the bottle to the Sankey family in 1943. It was abandoned in 1967. The bottle stood vacant for ten years until H.P. Hood and Sons, Inc. was persuaded to buy it and give it to Boston Children's Museum in 1977. Movies are sometimes projected onto the side of the structure for museum events. 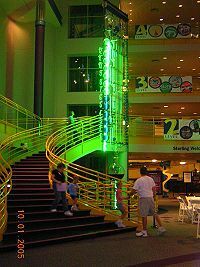 The Children's Museum of Indianapolis, the world's largest children's museum, is located in the city of Indianapolis, Indiana, United States. Founded in 1925, the museum claims to be the fourth oldest such institution in the world. It is located in a working class neighborhood immediately north of downtown Indianapolis. The current building was built in 1976, and has had several significant expansions since then. There are miniature exhibits throughout the museum as well as resource centers for tourists and schools. The main stairwell of the museum is actually a giant spiral ramp which allows visitors to access all five levels of the museum by walking or the use of strollers and wheelchairs. In 2006, world renowned glass artist Dale Chihuly installed a four story glass sculpture inside the central atrium of the giant spiral ramp. This installment is called "Fireworks of Glass" and is accompanied by an exhibit of Chihuly's glass blowing methods. What If? is a popular attraction located in the lower level of the museum. Upon entering, visitors explore an underwater setting which features a few fish tanks. Visitors then come upon an open area known as the Dinosaur Discovery Area where children used to be able to dig for dinosaur bones. This area has been replaced with a few plasters of dinosaur bones with plaques. To the left of this area, visitors can enter a darkened hallway which resembles the insides of an Egyptian pyramid. While touring the "pyramid" they can gaze at Egyptian artifacts, including a replica of the real mummy which resided there on loan from the Chicago Field Museum until 2007. The lower level also hosts its own planetarium (the largest one in the state of Indiana with a capacity of 130 people), a theater, and a real antique train engine and tool car that visitors can walk through. The Museum has an expansive courtyard, parking lot, and parking garage to accommodate large parties of visitors such as schools on field trips. The lobby of the Museum contains North America's largest water clock as well as a large museum gift shop and a food court. The museum also boasts a 3,000 square foot branch of the Indianapolis-Marion County Public Library called the InfoZone. This replaced a geology gallery and a replica of an Indiana cave that were the first area one visited before the front lobby expansion. The second level is where many temporary special exhibits are hosted. The only permanent exhibit on this level is Passport to the World, a two story exhibit which explores traditions and cultures from around the world. The third level features "The Power of Children: Making a Difference," a permanent exhibit featuring the stories of Anne Frank, Ruby Bridges and Ryan White and the impact these children made on the world. The Power of Children creates a supportive environment where people can examine and discuss issues related to prejudice and discrimination and seek solutions to problems. Recreated, historically accurate environments reflect the special space where each child spent time. First-person interpreters, live theater and real artifacts make it possible for the public to become fully immersed in the lives of Anne, Ruby and Ryan while sounds, dramatic lighting, words and moving images draw visitors into the exhibit. Also on this floor is Story Avenue. Visitors take a walk through tour of an African American community. The people are life size mannequins that talk when visitors pass. The exhibit is an overall look at the oral story-telling traditions of African Americans. This is in the former Clowes Gallery, once the home of rotating exhibits, and for a long time, an exhibit called Pastimes, which dealt with games and leisure of the past. The exhibit became less popular when some coin-operated devices were removed or deactivated, such as an old-style flipperless pinball machine in a 1950s-style malt shop setup and a flip movie, and when the malt shop stopped serving food. Next door is the preschool play area called Playscape. Playscape includes a big raised sandbox area for children to play in, a raised water river where kids can play with water toys (water protective clothing is provided as well as an air hand dryer), a construction site, and multiple other interactive areas for children to play in. The third floor used to house the large Tyrannosaurus rex model now outside the museum. It was a walk through time featuring concepts of the formation of the earth in a witch's cauldron, a large model of Paleozoic insects the size of chickens in their environment, a model Pteranadon, an exhibit surrounding the mastodon skeleton unearthed in Indiana in the 1980s, a gallery of heads of human ancestors, and the mummy exhibit in hieroglyphed walls. People were welcomed to the exhibit by multiplate artwork of a Stegosaurus. Perhaps one of the museum's most popular and unique exhibits is a real life-size indoor carousel in the Carousel Wishes and Dreams gallery. The carousel was originally built for an amusement park (now Broad Ripple Park) in 1917 and was restored and reinstalled in this museum. It is considered the museum's biggest gallery artifact. The carousel is a National Historic Landmark. Also on this level is Science Works, formerly Science Spectrum, an exhibit completely devoted to exploring natural science and physical science through building activities. Children may build toy boats to float along the waterway, play in a construction zone, erect an arch, climb a rock wall, crawl through "underground" tunnels, observe a live pond, and many other activities. Within Science Works is a newly constructed biotechnology laboratory, which hosts daily events focusing on the future of DNA and chemistry. The Dinosphere is located in the spherical wing of the museum which is separate from the other exhibits, where the Cinedome Theater was formerly located. There are several dinosaur art galleries and a wide open area which features fossil digs, real artifacts, and numerous life-size dinosaur fossils from the Cretaceous Period. Dinosphere features one of the largest displays of real juvenile and family dinosaur fossils in the U.S.
↑ 1.0 1.1 The Association of Children's Museums website Retrieved December 14, 2008. ↑ Thomas C. Palmer, Jr. "Dodger Owner Donates a Park to his Hometown." Boston Globe, March 13, 2006. Retrieved December 14, 2008. ↑ Adelaide B. Sayles. The Story of The Children’s Museum of Boston: From Its Beginnings to November 18, 1936. (Boston: Geo. H. Ellis Co., 1937), 2. ↑ Sayles, The Story of the Children’s Museum, vii. ↑ Sayles, The Story of the Children’s Museum, 77. ↑ Melissa Stuphen, "Children's Exhibits Stress Participation." The New York Times, October 8, 1981. Accessed on April 23, 2008. Retrieved December 14, 2008. ↑ "Museums and Galleries." Consulate-General of Japan in Boston. Retrieved December 14, 2008. ↑ Carol Lawson, "Exhibition for Children about Racism." The New York Times, October 22, 1992. Retrieved December 14, 2008. ↑ Sarah Boxer, "A Child's Eyes Don't Focus on Obvious Differences." The New York Times, July 22, 2004. Retrieved December 14, 2008. ↑ what is the museo pambata?museopambata.org. Retrieved December 22, 2008. ↑ Kathleen Lippens, President, Le Musée des Enfants "History of the Children's Museum." The Children's Museum. Retrieved December 14, 2008. ↑ "Interactive Graphic: Children's Museum." The Boston Globe. Retrieved December 14, 2008. ↑ "The Hood Milk Bottle Through the Years". Boston.com. Retrieved December 14, 2008. Brandehoff, Susan, "More Features - "Go Figure!" Exhibit Brings Kids and Calculations Together - A Children's Museum Exhibit Is on the Move, Reaching a National Library Audience." American Libraries 32 11 (2001): 60. Kenny, David H. Fifty Years Young: The Children's Museum. Newcomen publication, no. 1035. New York: Newcomen Society in North America, 1975. Sayles, Adelaide B. The Story of The Children's Museum of Boston: From Its Beginnings to November 18, 1936. Boston: Geo. H. Ellis Co., 1937. Shine, Stephanie and Teresa Y. Acosta. 2000. "Parent-Child Social Play in a Children's Museum." FAMILY RELATIONS 49: 45-52. Abstract. Retrieved December 22, 2008. "Interactive Graphic: Children's Museum." The Boston Globe. Retrieved December 14, 2008. Evan Richman, "The Hood Milk Bottle Through the Years". Boston.com. Retrieved December 14, 2008. "Museums and Galleries." Consulate-General of Japan in Boston. Retrieved December 14, 2008. The Association of Children's Museums website Retrieved December 14, 2008. "History of the Children's Museum." The Children's Museum. Retrieved December 14, 2008. Boxer, Sarah. "A Child's Eyes Don't Focus on Obvious Differences." The New York Times. July 22, 2004. Retrieved December 14, 2008. Lawson, Carol. "Exhibition for Children about Racism." The New York Times. October 22, 1992. Retrieved December 14, 2008. Palmer, Thomas C. Jr. "Dodger Owner Donates a Park to his Hometown." Boston Globe. March 13, 2006. Retrieved December 14, 2008. Stuphen, Melissa. "Children's Exhibits Stress Participation." The New York Times. October 8, 1981. Retrieved December 14, 2008. This page was last modified on 11 February 2017, at 15:59.